Anyway, about three weeks ago, we entered a new phase of sleep training: The cry-it-out-in-the-middle-of-the-night phase. We were inspired to give this a whirl after meeting with our pediatrician at Charlotte’s 4-month check up. At the appointment, she informed us that at 5 months, there was absolutely no reason why Charlotte would NEED to be eating in the middle of the night and that she was perfectly capable of sleeping through the night. From about 3.5-5 months, Charlotte was waking up twice a night (sometimes 3 times, sometimes once). While some parents don’t mind waking up and comforting their babes at 3 am, we just aren’t those people. It was totally fine when she needed to eat, but once given the okay, we were ready to let her figure it out. So, that’s what we did! As I explained in this post, the first couple of days were a little rough, but really, not even that bad. She fussed and cried for an hour and ended up putting herself back to sleep. After those first few nights, she just got progressively better and better. Most nights, she would wake up somewhere between 10 and 12 and 1 and 4 for anywhere from 5 to 45 minutes. After 2 weeks, it was only once a night and now, we rarely hear her at all and when we do, it’s just a subtle little noise and she’s transitioning into the next sleep cycle. I’m not going to lie, it’s amazing. Here’s a little snapshot of Charlotte’s sleep over the past week and month from my sleep tracking app. I don’t think the app is the best, but it works. Also, I’d recommend tracking sleep. 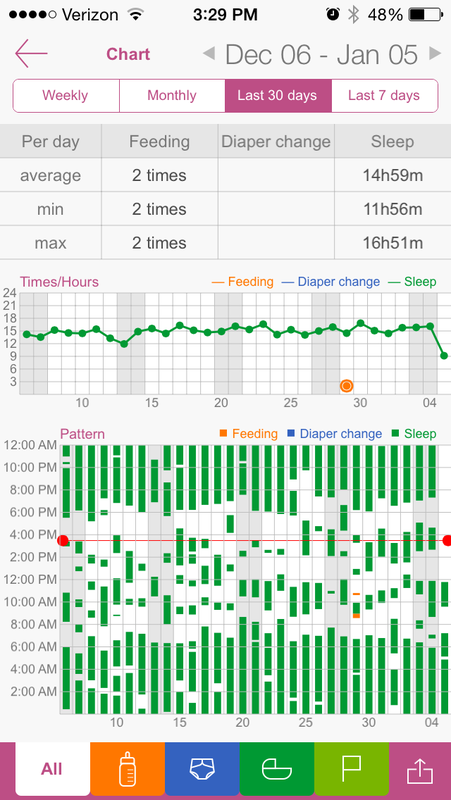 It really helps you stay on top of baby’s routine and needs. Over the past 6ish months, we have worked really hard to sleep train this little being. Whether it was at 2 months when I literally stayed home for three weeks straight to make sure Charlotte was napping every 1-2 hours in her crib, or the MANY nights and naptimes that left me covered in stress hives brought on by the screams and howls of our baby, we made sleep a priority. Now of course, we can’t take all (or likely even the majority) of the credit. Charlotte is a good sleeper and has a very independent side. I am positive that plays a role in this journey. But, regardless, we are so proud of our little sleeper. Charlotte goes to bed every night between 5 and 7 – most often around 6p. She sleeps 12 hours THROUGH THE NIGHT. And even better, she’s an expert napper. She has finally consolidated her countless 40 minutes naps into some really nice long naps. In fact, over the past few days, she’s been taking 2 naps and sleeping 4-5 hours total during that time. It’s really awesome. And it’s not just crib sleep, our little bunny can sleep in any pack n’ play or on any blanket (well, not anymore since she’s a rolling, scooting machine), as long as it’s in a dark room. It’s so convenient. Way to go, Charlie!! Mommy and Daddy appreciate it. Now, if we could only get our bums in bed earlier, we might actually feel rested. Also, I know I’ve mentioned the book Healthy Sleep Habits, Happy Baby before, but I want to mention again that this is the book we use to guide us in our sleep training journey. I really recommend it. It didn’t always have the answers we were looking for, but it seemed to keep us focused. 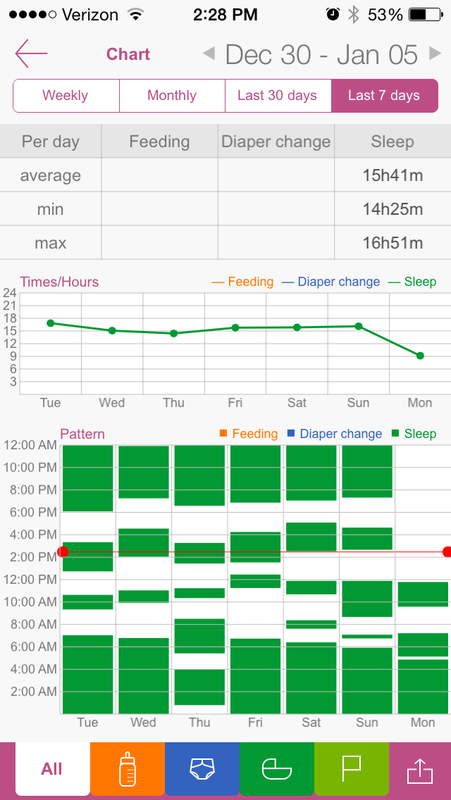 This entry was posted in New Baby and tagged 5 Month Old, CIO Method, Cry it Out, Healthy Sleep Habits, infant sleep, New Baby, New Mom, Sleep Training. Bookmark the permalink. That’s great that sleep training has been going so well lately! We waited quite awhile to start officially sleep training Cupcake since we were traveling a lot in the fall. It is SO lovely to be able to put her down now and not have to sneak out with the fear of waking her up and having to rock her back to sleep! Hahha I know, right?? I like being able to hug and smooch my baby right before I put her in her crib!